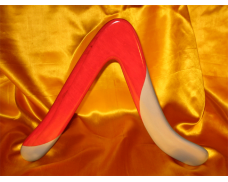 This boomerang tends to be a low flier, so it is recommended that you have developed skill in throwing the other styles of boomerangs above so that you can control this one and prevent it from falling to the ground. It really is a superb boomerang in experienced hands, and tends to fly further than the Beginner to Intermediate boomerangs. This style comes in quickly and low to the ground, thus is harder to catch which demands more skill. Unlike the boomerang styles listed above, the Kamikaze does not usually hover down but sort of whips in, low to ground. 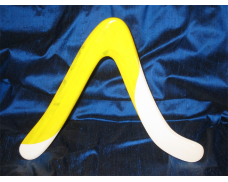 You will need a lot of space to throw this boomerang and must possess accurate throwing skill, to prevent it from going out of control. This takes practice to master. It would be wise to warm up by throwing a less advanced style, then progress to this one. It's a great deal of fun once you've mastered it! 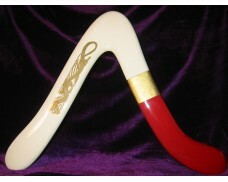 Kamikaze Boomerang - White, Ruby and Gold with Dragon. 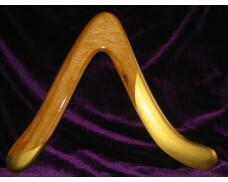 This boomerang tends to be a low flier, ..
Kamikaze Boomerang - Light Brown and Gold. 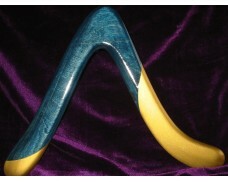 This boomerang tends to be a low flier, so it is rec..
Kamikaze Boomerang - Indigo Blue and Gold. 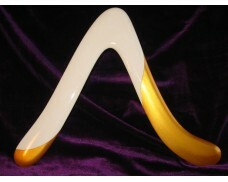 This boomerang tends to be a low flier, so it is rec..
Kamikaze Boomerang - White, Yellow and Gold with Dragon. This boomerang tends to be a low flier..
Kamikaze Boomerang - White and Gold. 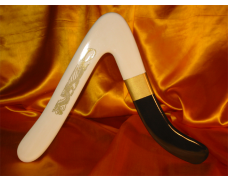 This boomerang tends to be a low flier, so it is recommended th..
Kamikaze Boomerang - White, Black and Gold with Dragon. 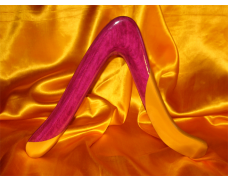 This boomerang tends to be a low flier..
Kamikaze Boomerang - Fuchsia and Gold. 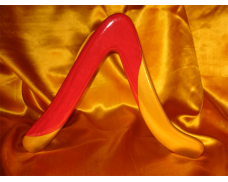 This boomerang tends to be a low flier, so it is recommended ..
Kamikaze Boomerang - Red and Gold. This boomerang tends to be a low flier, so it is recommended that..
Kamikaze Boomerang - Red and Silver. 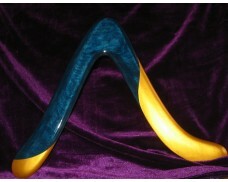 This boomerang tends to be a low flier, so it is recommended th..
Kamikaze Boomerang - Lapis Blue and Gold. This boomerang tends to be a low flier, so it is rec..
Kamikaze Boomerang - Black and Gold. 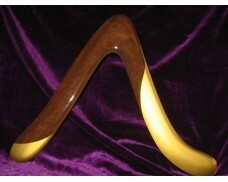 This boomerang tends to be a low flier, so it is recommended th..
Kamikaze Boomerang - Dark Brown and Gold. 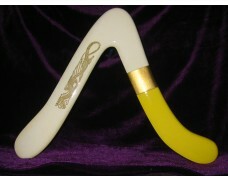 This boomerang tends to be a low flier, so it is recommend..
Kamikaze Boomerang -Yellow and White. 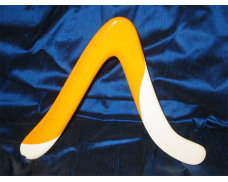 This boomerang tends to be a low flier, so it is recommended t..
Kamikaze Boomerang - Orange and White. 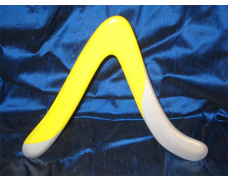 This boomerang tends to be a low flier, so it is recommended ..
Kamikaze Boomerang - Yellow and Silver..